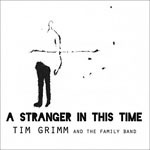 Share the post "Album review: TIM GRIMM AND THE FAMILY BAND – A Stranger In This Time"
As the billing suggests, multi-talented folk/country singer/songwriter and actor (the TV series Reasonable Doubts, and films including Clear And Present Danger with Harrison Ford) Tim Grimm’s latest release is something of a family affair ‘supported ably by sons Jackson (guitars, banjo, octave, mandolin and backing vocals) and Connor (bass), and wife Jan Lucas (harmonica, and backing vocals). And as the title hints, the album is one that’s ‘out of time’ – backtracking to the era of Johnny Cash, and Woody Guthrie – one where the story and the telling were the focal point. But A Stranger In Time not only walks in the footsteps of the greats like on the rootsy ‘Thirteen Years’ and ‘Darlin’ Cory’, but brings the genre bang up to date with the more contemporary blues rock infused indictments of modern day corporate America in the form of sideswipes at both Trump (‘Gonna Be Great’) and the oil industry (‘Black Snake’). With Grimm’s gravelly, Chris Rea style, vocals ideally suited to the material, and some particularly sympathetic accompaniment, there can be little doubt that, like his last six releases, A Stranger In This Time will be heading straight to top of the folk/Americana roots charts. This entry was posted in ALBUM REVIEWS, ALBUM REVIEWS (Mobile), All Posts and tagged A Stranger In This Time, album, Americana, bluegrass, country, review, roots, singer, songwriter, Tim Grimm And The Family Band. Bookmark the permalink.